Edgar Lungu is abusing public funds with impunity, says Zambia Action for Young Leaders coordinator Bernard Kasonde. 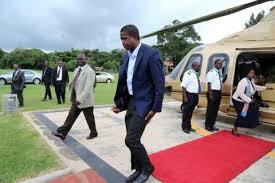 On Friday, Lungu opted to use the presidential chopper from State House to Mulungushi International Conference Centre where he attended a Zambia National Farmers Union annual congress. But Kasonde said PF president Lungu should start to think about the poor Zambians. He said Zambians should document all the abuses of public funds by President Lungu’s government. Kasonde said President Lungu would soon start using a chopper to move within State House. And Kasonde said it was a shame that the PF had neglected the education sector.